This 14-inch touch-enabled Chromebook finally hits the market three months after HP announced it, packing a Full HD display, NVIDIA's Tegra K1 processor, 4 GB RAM and 32 GB of internal storage. 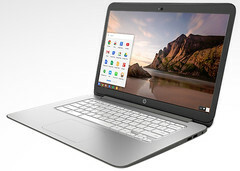 HP announced two new Chromebooks with touchscreen displays back in September, namely the Chromebook 11 and the Chromebook 14. After all this time, the HP Chromebook 14 is finally available for purchase from the HP Official Store. As most consumers complained about the 1,366X768 pixels glossy display of the previous Chromebook 14, HP decided to offer a Full HD LED backlit touchscreen display with the new variant. The new Chromebook 14 is powered by the new NVIDIA Tegra K1 SoC, next to 4 GB of memory and 32 GB of eMMC internal storage. HP Chromebook 14 also features a microSD card reader, WiFi 802.11ac and Bluetooth 4.0 combo, HDMI, one USB 3.0 and two USB 2.0 ports, as well as a TrueVision HD webcam with digital microphone. It weighs 3.77 pounds and promises to offer over 8 hours of battery life on a single charge. The touch-enabled HP Chromebook 14 model x050nr sells for $439.99 USD and is covered by a one-year limited hardware warranty combined with 90-days limited software technical support.